Those predictions of $4 a gallon gas prices don’t appear quite so radical anymore. 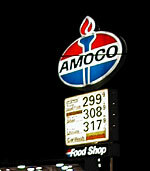 Late yesterday, the price hit $3.35 a gallon in the Twin Cities, according to the gasprices.com Web site. Yeah, that’s a record. Step into the Wayback Machine. It was the evening of the September 11 attacks on the United States and drivers were shocked by an unbelievable jump in the price of gasoline, double and triple the price that was posted on the drive in to work that day. $2.99? We’d line up for blocks to pay that now. Back then, however, it unleashed the bureaucratic guns. OK, now, here’s what I’m looking for. People who ride their bikes to work. People who ride their bikes a long way to work; the kind of route that leaves you a stinking mess by the time you get there. I feel a “three minute tale” coming on about you. So e-mail me, if you’d like some slow-pedaling, journalistic (sort of) company some morning. The most expensive gas pump I visited was in DeadHorse Alaska, aka Pruedhoe Bay. That gas sold for $5.13/gallon in the summer of 2002. The second most expensive gas was on the same trip on the Dalton Highway at Hotspot near the Yukon River. The “pump” was a hose fed by gravity from a red metal tank. I sometimes ride my bike but this is the time of year where I ride my scooter. I filled up the tank yesterday and it came to $2.85 and I’ll be able to drive a 100 miles on that. $4 a gallon? Bring it on! I’ve gotten some very good email from people who ride their bike a long way. Now I’ve got to figure out how to balance a tape recorder, video camera, and shotgun microphone while riding a ridiculously long way with you people. Re: Scooter. Mark, here’s the problem I have with you and your scooters. They’re too slow for the street, but too fast for the sidewalk. I paid $3.89 for gas in Alameda, CA today. I expect we’ll break the $4.00 mark very soon. Oh contraire Bob! My scooter can make it to 55mph. It’s 150cc engine. It is possible to find an appropriate urban assault vehicle that will perform. Stay away from those so called scooters that are 49cc. They are indeed whimpy.